For many New Yorkers who viewed the video capturing Eric Garner getting restrained by police officers in Staten Island moments before he died, the initial reaction was shock—at the sheer amount of force the officers used to subdue the man, and at how Garner repeated 11 times, “I can’t breathe,” while an officer kept his arm tightly wound around Garner’s neck. Then, the second question asked by the public: Most of the officers were white, and Garner was black. Would the police officers in the video have treated Garner the same had he been a white man? When another unarmed black man, Michael Brown, was killed by a white police officer a month later, this time in Ferguson, Mo., people began to seriously consider the racial undertones. Thousands of protesters sounded a loud and clear message: the trust that was supposed to exist between police and the communities they serve had been severed. Garner and Brown’s deaths not only fueled weeks of protests across the country, but propelled the American public to take a hard look at how law enforcement interacts with people of color, and whether it does so fairly and responsibly. Furthermore, the thousands of protesters sounded a loud and clear message: the trust that was supposed to exist between police and the communities they serve had been severed. Here in New York City, the NYPD has shown a downward trend in its most deadly use of force, gunfire. In 2013, the NYPD shot and killed eight subjects, compared to a peak of 93 in 1971, when the department first kept track, according to the NYPD’s latest firearms discharge report. All subjects had been armed with a weapon. With the question of racial disparity, critics of the police department have held that the “broken windows” policing strategy adopted by Police Commissioner William Bratton—which punishes low-level, quality-of-life offenses to deter more serious crimes from happening—disproportionately arrests people of color more than whites. After all, Garner was placed under arrest for allegedly selling untaxed cigarettes, they argue. In October, the John Jay College of Criminal Justice released a report on trends in misdemeanor arrests in New York City. It found that the peak arrest rate (number of arrests per 100,000) for blacks during the period between 1990 and 2013 was 7.5 percent, compared to 1.4 for whites. The peak for Hispanics was 4.7 percent. For now, broken windows is here to stay. Mayor Bill de Blasio has made his support for it clear, saying that it works. He vows to mend police-community relations by retraining the police department on how to use force. The public will have to wait until next year to see whether the training will help achieve that goal. Garner and Brown’s deaths propelled the American public to take a hard look at how law enforcement interacts with people of color. Earlier this month, a Staten Island grand jury announced that it would not indict the officer who placed Garner in a chokehold. The Office of the Chief Medical Examiner had ruled that compressions to Garner’s neck and chest, Garner’s more than 300-pound weight, and his pre-existing medical conditions, were factors in his death. The decision has once again sparked outrage, protests, and a debate about our criminal justice system’s ability to hold police officers accountable for their actions. 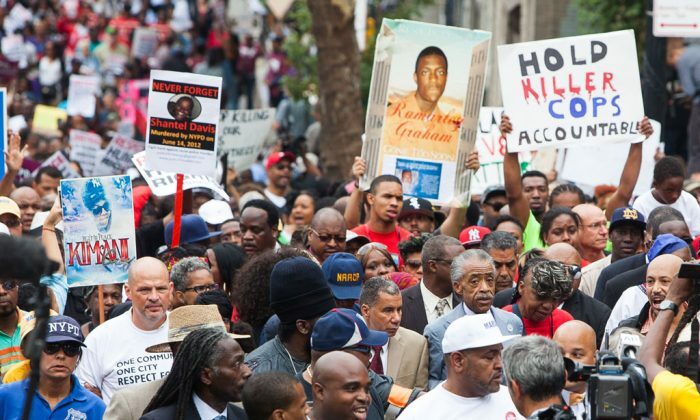 The Garner family still awaits the results of a federal civil investigation into Garner’s death. The recent assassination that left two NYPD officers dead threatens to drive the rift between police and the community even further. The officers were shot by someone claiming to want revenge for Garner’s death. The world will continue to watch as the country grapples with how policing should work in the 21st century. Following the death of Eric Garner, the city agency in charge of investigating civilian complaints of police misconduct, the Civilian Complaint Review Board (CCRB), came into the limelight for its role in holding police officers accountable. Garner died after an arrest, where officer Daniel Panteleo used a chokehold to restrain Garner after he resisted arrest for selling loose cigarettes on the street in Staten Island. The agency soon announced that it would conduct a study on the over 1,000 chokehold complaints that it received from 2009 to 2014. The report released in October found that the NYPD failed to enforce its own policy ban on using chokeholds, defined as “any pressure to the throat or windpipe, which may prevent or hinder breathing or reduce intake of air.” Disciplinary judges within the department chose not to discipline officers who performed the chokehold by not applying the definition consistently, according to the report. Out of 1,128 chokehold complaints lodged between 2009 to June 2014, 10 were substantiated, or found to have been valid. The CCRB recommended the most serious form of discipline in each of the 10 cases—which could amount to loss of vacation time, suspension, or termination from the department—but the NYPD only served such punishment in three cases. The report also found fault with the CCRB itself, noting its delay in completing investigations, and its failure to categorize certain complaints as chokehold allegations. The agency has since implemented several reforms, including launching a web application for people to keep track of their complaint’s status, publishing data onto its website, and holding board meetings in different neighborhoods in the city to allow for more public input. 1 — number of chokehold complaints substantiated.